On the book tour for the fourth novel in Bella Osborne’s ‘Ottercombe Bay’ series called ’Shaken And Stirred’, enjoy an extract from the tale. Tamsyn was woken by the sound of Jason’s voice and by the time she’d opened her eyes he was placing a tray on her bed. It was the 22nd of March. ‘Good morning,’ he said ridiculously cheerily. ‘Your mum let me in. This is the start of Tamsyn Turvey Day,’ said Jason proudly. ‘Toast and tea and a yellow rose because I know you like those,’ he added pointing to the things on the tray. Tamsyn couldn’t help the beam of a smile spreading across her face. She had a feeling she was going to enjoy today very much. Their first stop was her absolutely favourite place, the donkey sanctuary, and thanks to Jason knowing the vet’s cousin she was allowed to spend the morning being a keeper. ‘You all right?’ called Jason, from a safe distance as Tamsyn flung manure and straw into a wheelbarrow. ‘It’s ace. I definitely want my own donkey,’ said Tamsyn, her face serious. Next there was feeding and grooming and before she knew it she was out of her green overalls and borrowed steel cap boots, and sitting with a cup of coffee in the sanctuary café. He was so kind and thoughtful, she thought. If today was about showing her what things would be like to be his girlfriend he was selling himself well. ‘You know you don’t have to do any of this,’ she said. ‘It’s not a bribe. I’m not expecting you to declare your undying love for me or anything.’ He gave a strangled laugh. The next stop was another favourite of hers. The freshest local fare from the fish and chip van eaten on the sea front with a wooden fork with seagulls swooping above them in the hope of snatching a stray chip. It was a beautifully sunny day and the sea was rolling tamely onto the beach – it didn’t come much better in Tamsyn’s book. When she thought she was too full to eat anything else Jason produced a cake box from his rucksack. She was too excited to finish the sentence. ‘Scones and clotted cream,’ he announced, flipping open the box lid. Tamsyn was in heaven. ‘Uh-uh,’ said Jason with a shake of his head. ‘Not done yet.’ He checked his watch. ‘Come on.’ He held out his hand and Tamsyn took it. His fingers were warm and curled gently around hers. They both looked at their entwined hands and grinned. Something was starting to feel right. Did you enjoy that taster? 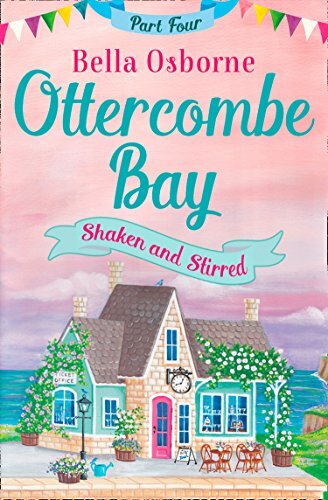 Well, good news, you can buy Ottercombe Bay – Part Four: Shaken and Stirred from Amazon for only 95p!